'A visual feast of food and words' is how I would describe Shauna James Ahern's tantalising blog Gluten-Free Girl. 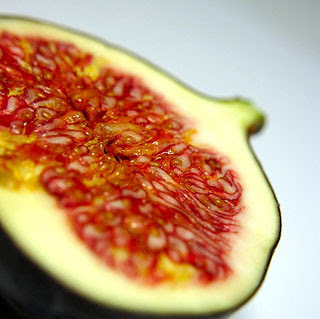 what has made you a better cook, and what do you like to eat with figs? The Prue Leith College of Food and Wine (now the Prue Leith Chef's Academy) in Pretoria, South Africa made me a better cook...a trained chef in fact. It also made me agressive due to the time constraints inherent in food preparation, impatient due to the perfectionism demanded of the job and, eventually, loathsome of the thing that I had once loved the most to do. The celiac sealed the deal...get out unscathed before the profession took me down. These days it is patience that has made me a much better cook. A willingness to see that there are many roads that lead to Rome, that all willing participants in the kitchen (mostly my precious husband) have their own style which can be best harnessed, and an inherent sense of adventure in trying out old favourites with new gluten-free ingredients. With figs? Goat's chevin and free-range ostrich biltong, eaten with oven-roasted red peppers. It's strange when a random question can evoke such strong memories and feelings of what now feels like a long-past chapter of my life. The way I see it? A recipe is only as good as the quality of its ingredients. Same goes for a life.